Mozilla’s Firefox, one of our favourite web browsers, brings some nifty new features in its latest update. Firefox 35 introduces a cross-platform video chat service called Firefox Hello, lets users beta-test the new Firefox Marketplace, and also bakes in social sharing on the web. There are plenty of free alternatives to Skype, but few have the ease of Firefox Hello. It’s so simple, anyone can use it. You click the Hello icon, start a new conversation, and copy-paste the link to anyone whom you want to video chat with. No sign-ups required! Firefox Hello will remember your conversations and keep those links alive until you delete them, so you can give each chat window a unique name for the people you call often. And yes, you don’t need Firefox to use it, it will work on any web browser that supports WebRTC, like Chrome or Opera. You can choose to mute the audio or stop the video at any time. Sign in with your Firefox ID and you can import contacts from other services. That said, Firefox Hello is still missing a few features. Most importantly, you can’t start group video chats, it’s one-to-one conversations only. Also, you can’t share your screen, like with Google Hangouts or Skype. For the same no-signup experience, Appear.in still seems like the most convenient video chat service. But Firefox Hello is pretty nifty for regular one-on-one chats. Browsing and sharing are intertwined, integral parts of the web surfing experience now. Firefox wants to make it easier for you to share content without cluttering up your toolbar. Firefox Share integrates several popular social networks and bookmarking services into a single button. So whether you want to share an item on Facebook or Twitter, you click the same button in the Firefox toolbar, which will auto-load the content of the page you are viewing. Firefox Share also supports Gmail, LinkedIn, Tumblr and several others. Check out the full list of services—but be warned, some of these are activated in the sidebar (and you’ll see a note for them). Cleaning up a cluttered toolbar is a great idea, but Firefox Share doesn’t really do a better job than existing services like Buffer. The Buffer extension for Firefox is great for sharing, and you can cross-post to multiple networks simultaneously too. Plus, not all services get compacted into the Share button. For example, the awesome bookmarking service Pocket appears as its own extension icon, defeating the purpose. 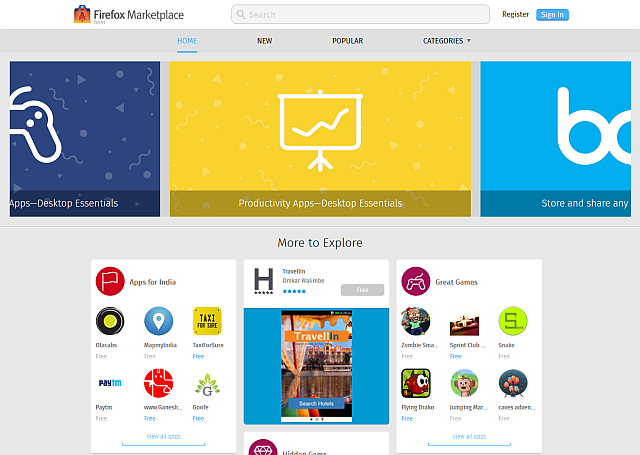 Back in 2010, the Chrome Web Store integrated Chrome apps, extensions and themes in one place. Mozilla’s answer is the Firefox Marketplace, currently in beta. So if you want one of the best Firefox Add-ons, you now have to go to the Marketplace instead of the old Add-ons page. The biggest benefit here seems to be collections of web apps and extensions, like a suite of productivity apps or a curation of “hidden gems” on Firefox. Who knows, you might just discover some more great Firefox extensions that no other browser has! Firefox 35 also includes built-in support for H.264 (MP4) video on Mac OS X, a new search UI, better performance while resizing high-quality images, and some other improvements. The Android version has improved geolocation services and the Download Manager can now keep track of downloaded files. Do these changes, especially Firefox Hello and Firefox Share, make you want to switch to Firefox or will you be sticking with your current favourite browser?